What's hotter than a Keith Urban guitar solo? July didn’t go as planned, but we still had a stellar month in Nashville. I was hoping we might breach that 4,000 sales “ceiling” that we keep bumping against, but rarely break through. We’ve broken it once, but it was way back in June 2006. We hit 4,060 sales 11 years ago, and the closest we’ve come since then was May 2017 when we recorded 3,943 sales. Based on history, I don’t expect this August to be our magical month, so we will just have to wait until next year. Now, don’t get me wrong, the Nashville real estate market is still hotter than a Keith Urban guitar solo. This month we had 3,872 sales across all categories: Residential, Condo, Multi-Family, and Land. Which was a 4.5% increase over the same month last years. And virtually the same as the previous month’s sales. We also recorded a median sales price of $288,243 for single family homes and $203,000 for condominiums. This is 10.8% higher than July 2016 (for residential) and is nearly the same as the previous month’s residential median price. The inventory has been my biggest concern of late. Last month I was happy to report an increase in inventory. It had been a while since we saw a boost in the middle of the busy season. And this month I get to share the same great news. 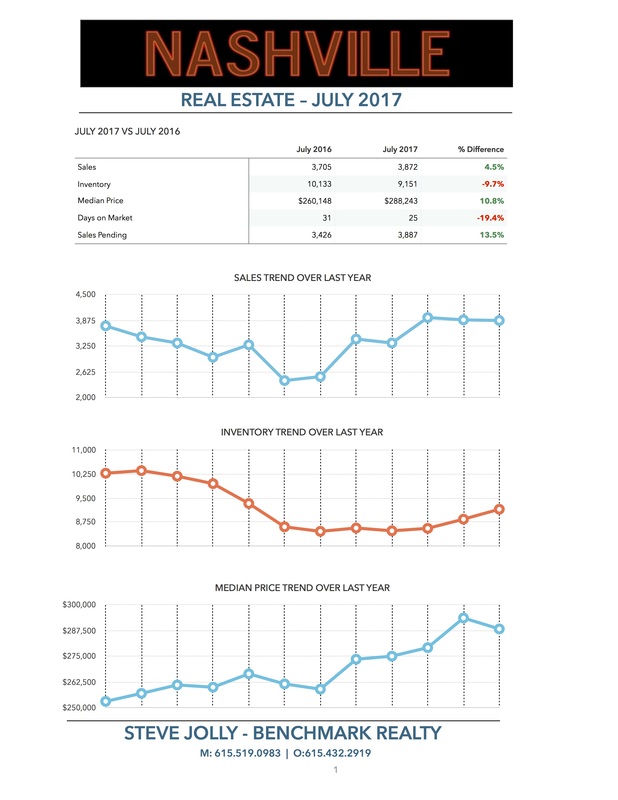 Although, inventory was down 9.7% when we looked at the year-over-year, there were 309 more homes on the market in July 2017 as compared to June 2017. That’s a pretty good increase considering the time of year. This is great news for buyers. While the most popular price ranges are still very active, the overall pressure on the market has let up somewhat. This is also helping to keep appreciation at a more reasonable level. I’m all for rising prices, but I’d prefer the next downturn to be a correction instead of a crash. Long-term double digit increases spelled trouble for many communities across the nation after the mortgage crisis. For the short term, I expect August to be a lot like July. It is typically the kickoff to the fall selling season and I’m looking forward to another amazing month. If you have any questions about the value of your home in this market, just give me a call and I'll be glad to share my data and opinions with you. The Daily Deal in Nashville is a newer home in Sylvan Park with a two car attached garage that is listed for less the $435,000.